The aim of this study was to assess the magnitude of the survival benefit of renal transplantation compared with dialysis in patients selected for transplantation in Scotland. Longitudinal study of survival and mortality risk in all adult patients (1732) listed for a first transplant between January 1, 1989, and December 31, 1989, in Scotland. A time-dependant Cox regression analysis adjusted for comorbidity, sociodemographic and geographic factors, primary renal disease, time on dialysis, and year of listing compared the risk of death for patients receiving a first cadaveric transplant versus all patients on dialysis listed for transplantation. After adjustment for the covariates, the relative risk (RR) of death during the first 30 days after transplantation was 1.35 (95% confidence interval [CI], 0.63 to 2.86) compared with patients on dialysis (RR = 1). The long-term RR (at 18 mo) for the transplant recipients was 0.18 (95% CI, 0.08 to 0.42) when compared with patients on dialysis (RR = 1). This lower long-term risk of death was present in all patients undergoing transplantation, irrespective of their age group or primary renal disease. Similar results were seen when survival with a transplant was censored for graft failure. The projected life expectancy with a transplant was 17.19 yr compared with only 5.84 yr on dialysis. Despite an initial higher risk of death, long-term survival for patients who undergo transplantation is significantly better compared with patients who are listed but remain on dialysis. A successful transplant triples the life expectancy of a listed renal failure patient. Improvements in immunosuppressive medication, organ procurement, patient preparation, as well as surgical technique have resulted in a significant increase in survival after renal transplantation over the past decade. Survival on dialysis itself has also improved throughout the years because of better therapeutic regimens and patient monitoring. Given the continuing increase in the number of patients requiring renal replacement therapy and the considerable expenses associated with this treatment, it is important to determine the likelihood of survival on dialysis as well as transplantation, and to quantify the extent of any survival difference between the two treatment modalities. This could allow identification of groups of high-risk patients in whom transplantation may not be as successful. Early studies (1,2) failed to identify a significant survival benefit for transplantation over dialysis, mainly because of a methodological bias, as they were comparing survival from the time of transplantation for transplant recipients with survival from the start of replacement therapy for dialysis patients, or the studies did not recognize that transplantation is a time-dependent therapy as it occurs at a variable interval from listing. A study published in 1999 (3) solved this bias and showed a substantial reduction in the long-term risk of death after cadaveric transplantation compared with dialysis. Wolfe et al. determined that renal transplantation doubles the life expectancy of a patient on dialysis listed for transplantation in the United States. However, these results have never been confirmed elsewhere in other large national data sets. There are only two European single-center studies (4,5) suggesting a survival benefit for transplantation, but the reduction in the risk of death has not been correlated with a quantified increase in the life expectancy of the end-stage renal failure patient who is on the waiting list for a renal transplantation. Because most of the findings reported so far are based on the US experience, where patient selection and access to transplantation are different from other programs, these results cannot be extrapolated to a European setting. Furthermore, survival on dialysis and the 5-yr survival on transplantation are lower in the US than in the UK (6,7) and the rest of Europe (8,9). A recently published study found a survival benefit for transplantation over dialysis in an elderly group of patients in Scotland (10), suggesting results comparable with those noted in the US. However, this was a small study and, because there are no national data on this issue in the UK, comparisons with US registry data studies were not appropriate. Therefore, we decided to perform an 11-yr national study to investigate whether the survival advantage noted in the aging patients is present in all patients listed for transplantation and to quantify the gain in the life expectancy of an end-stage renal failure patient after transplantation. In Scotland, a country of five million people, 4532 adult patients started dialysis between January 1, 1989, and December 31, 1999. 1736 of these patients (38%) were listed for a first cadaveric transplant in this period and were included in this study. 1095 patients (24% of the initial population) underwent transplantation during the study period. All patients were listed and underwent transplantation according to the United Kingdom national criteria, irrespective of any demographic or disease-related factors. Demographic data for these patients obtained from the Scottish Renal Registry and UK Transplant included age at listing/transplantation, dates of listing and transplantation, dates of death and last follow-up, gender, primary renal disease, type of first replacement therapy and length of dialysis prelisting, social deprivation score (11), and listing/transplant center. Extensive data on comorbidity accrued until listings were collected from the case notes. Survival was considered from the time of listing until death, end of study (December 2000), or last follow-up available, whichever came first. A time-dependant Cox regression analysis adjusted for demographic variables (model 1) and for demographic and comorbidity variables (model 2) were used to account for the fact that patients switch between dialysis and transplantation during follow-up. All patients contributed follow-up time to the dialysis group, whereas those receiving a kidney transplant contributed follow-up to the transplant group after grafting. A secondary analysis using the same two models but censoring at graft failure was also performed. Subsequent survival after graft failure was considered toward the follow-up in the dialysis group. The effect of transplantation is reported as relative risk (RR) of death, which is the rate of death among transplant recipients relative to dialysis patients on the waiting list. The average RR of death was estimated for three intervals after transplantation: 0 to 30 days, 31 to 365 days, and beyond 365 days, and is presented with 95% confidence intervals (CI). Survival curves were generated using a Kaplan–Meier method, whereas differences in proportions and means were tested using χ2 test and t test, respectively, with P≤0.05 considered as significant. The projected years of life on dialysis and with a kidney transplant from the waiting list moment were determined assuming a constant death rate throughout the study period. In the groups that are not followed-up until 50% of the patients have died, a continuing death rate equal to the one observed was assumed. 1736 adult patients started renal replacement therapy and were listed between January 1, 1989, and December 31, 1999. 1095 (63%) received their first cadaveric kidney transplant by the end of December 2000. Table 1 shows the demographics at the listing moment for all patients and for the two treatment groups (dialysis and transplantation). Although all these patients were considered suitable for transplantation and listed, there were significant differences between the two groups, those who received a transplant being listed at a younger age (43 versus 53 yr) and sooner after starting renal replacement therapy (0.5 versus 0.78 yr). In addition, there was a significantly higher prevalence of diabetes and multisystem diseases as a cause of renal failure among those patients who remained on dialysis (P < 0.0001, χ2) compared with the transplant recipients. A comparison of the comorbidity accrued until listing in the two treatment groups is illustrated in Table 2. Overall, there was a higher prevalence of comorbidity in the group that was listed but remained on dialysis. These patients had twice the incidence of myocardial infarction and angina when compared with the patients who were listed and received a transplant. There was also a significantly higher prevalence of cerebrovascular diseases, gastrointestinal disorders, and smokers in the dialysis group. The crude mortality rates in the two groups of patients are shown in Table 3. Those patients who received a kidney transplant had a 54% lower mortality rate compared with the patients who were listed but remained on dialysis. The RR of death for transplant recipients compared with patients on the waiting list on dialysis varies depending on the length of follow-up. The average risk (95% CI) was determined for three periods after kidney transplantation: 0 to 30 days, 31 to 365 days, and beyond 365 days; RR data are shown in Table 4. When compared with patients on the waiting list, transplant recipients appear to have an increased risk (although not statistically significant) of death within the first month after grafting (RR = 1.35; 95% CI, 0.63 to 2.86). The risk becomes significantly lower during the first year after transplant and reduces even further beyond 1 yr. The long-term RR for the transplant recipients is 68% lower than that of patients on the waiting list (RR = 0.32; 95% CI, 0.25 to 0.40; P < 0.0001). Because there were significant differences in the comorbidity profile of the two groups of patients, this model was further adjusted to account for these differences. As shown in Table 4, the same evolution of the RR was noted with a comparable long-term benefit for transplantation over dialysis (RR = 0.28; 95% CI, 0.20 to 0.39; P < 0.0001). A more detailed analysis of the first 18 mo after transplantation was also performed for the whole study population to allow comparisons with the US data. This showed a continuous reduction in the RR to RR = 0.18 (95% CI, 0.08 to 0.42; P < 0.0001) at 18 mo as shown in Figure 1. Relative risk of mortality over time after transplantation versus dialysis patients on the waiting list in the first 24 mo posttransplant. Nonproportional Cox models adjusted for age, gender, primary renal disease, social deprivation, time since wait-listing (model 1), and comorbidity (model 2). The outcome varies among different subgroups of kidney transplant recipients, as shown in Table 5. In all groups in which the risk could be calculated, there seems to be a higher probability of dying in the immediate posttransplant period. The risk becomes equal during the first year and is significant lower beyond 1 yr in most patients receiving a kidney transplant compared with patients on dialysis, with the exception of patients aged 18 to 34 yr, for whom the benefit of transplantation is not significant even at this time point (RR = 0.23; 95% CI, 0.05 to 1.14; P = 0.07). Diabetic patients had a 67% lower risk at 1 yr after transplantation compared with patients on dialysis (RR = 0.33; 95% CI, 0.15 to 0.74). Although the initial (<30 days) excess risk was small and not statistically significant, the long-term benefit was inferior to that observed in patients with multisystem disease or glomerulonephritis who had a much lower RR (RR = 0.13 and 0.16, respectively) 1 yr after grafting. There was a significant reduction in the RR of death after transplantation in all age groups. The greatest benefit was achieved in patients aged 50 to 59 yr, whereas patients aged 18 to 34 yr had no significant benefit from undergoing transplantation even at 1 yr after grafting. Additional analyses explored possible interactions between the covariates presented in Table 5, with particular emphasis on primary renal disease and age, but only marginal effects were noted for diabetes and age, diabetes and gender, and multisystem disease and age. When survival after transplantation was censored for graft failure, the impact of a functioning transplant on survival was determined. As shown in Table 6, similar results were obtained. The RR was significantly higher immediately after transplantation compared with dialysis and it evened out during the first year. At 12 months, a functioning graft increased a patient’s chances of being alive by 70% compared with dialysis. The projected life span for patients who were listed but remained on dialysis was 5.84 yr compared with 17.19 yr for those patients who were listed and received a transplant. The differences in the projected life expectancy between transplant recipients and dialysis patients are shown in Table 7. Although diabetic patients seem to have the shortest overall life expectancy, transplantation in these patients leads to the highest proportional increase in the life span compared with all other groups. In patients aged 65 yr or older, transplantation leads to a twice-longer life expectancy compared with dialysis, with this proportional increase being greater than that noted in patients aged 18 to 34 yr. The long-term survival and the risk of death are two of the main indicators for the success of any medical procedure. Since the early days of renal transplantation, the outcome of transplantation has been compared with that of various dialysis methods. Most of these studies, however, were biased by the lack of appropriate statistical methods (12). Recent studies, which have eliminated the different biases, have suggested that transplantation provides a significant survival advantage when compared with dialysis (3,13). However, very few studies account for the fact that even listed patients represent a heterogeneous group with significantly different comorbidity load between patients who remain on dialysis and those who receive a transplant. Furthermore, such comparisons based on national data in the UK were not available until now. In Scotland, where the UK national rules for listing and organ allocation apply, there appears to be a significant selection process in listing patients for transplantation. This is illustrated by the constant reduction in the crude mortality rates throughout the whole process from the start of renal replacement therapy to transplantation as shown in Table 3. These results suggest that any survival comparisons between the dialysis and transplantation should be performed only in listed patients to minimize the impact of the selection process. However, it is important to highlight that although all patients in this analysis were considered suitable for transplantation and therefore listed, there were significant differences between those who remained on dialysis and those who received a kidney graft. As shown in Table 1, transplant recipients were listed at a younger age and spent a shorter time on dialysis prelisting than those who remained on the waiting list. Also, fewer diabetic subjects and patients with multisystem disease underwent transplantation during the follow-up period. Because this study covers an 11-yr period, these findings seem to suggest significant variations in the selection process as well as a trend to include an increasing number of high-risk patients in the transplantation program in recent years (13,14). The comparison of the comorbidity load shown in Table 2 confirms this hypothesis, with patients who were listed and remained on dialysis having more comorbid conditions, which may preclude them from receiving a transplant. Therefore, any comparative analyses should also be adjusted for these factors. The recipients of a kidney transplant have a 68% lower long-term (> 1 yr) risk of dying compared with dialysis patients on the waiting list after adjustment for age, gender, primary renal disease, and length of time on dialysis. Similar reductions in the RR of death (64 to 75%) were reported in the US (3), Canada (12), Germany (5), and Sweden (4). International comparisons are difficult because of differences in survival on dialysis (8,9) and transplantation between North America and Europe, but despite the absolute differences in crude mortality rates, the results of these similarly constructed and conducted studies indicate that the effect of transplantation on survival is comparable across the Western world. Because comorbidity accrued by patients until the listing moment has a significant impact on the chances of transplantation and survival, we conducted an analysis adjusting for comorbid conditions to investigate whether our findings are consistent. Significantly more high-risk patients remained on dialysis on the waiting list rather than receiving a transplant, but even after adjustment for comorbid conditions and other demographic variables, transplantation has a persistent survival advantage at 1 yr (RR = 0.28; 95% CI, 0.20 to 0.39) compared with dialysis. The effect of transplantation on survival varies with time. In the immediate postoperative period, there seems to be an increased risk of death for transplant recipients (RR = 1.35; 95% CI, 0.63 to 2.86). Although these findings did not reach statistical significance, they are in agreement with other published data, suggesting that there is an increased risk of death in the immediate postoperative period. The lack of statistical significance may be explained by improved postoperative care, which leads to fewer postoperative deaths, and a more strict selection of patients for transplantation in the UK. 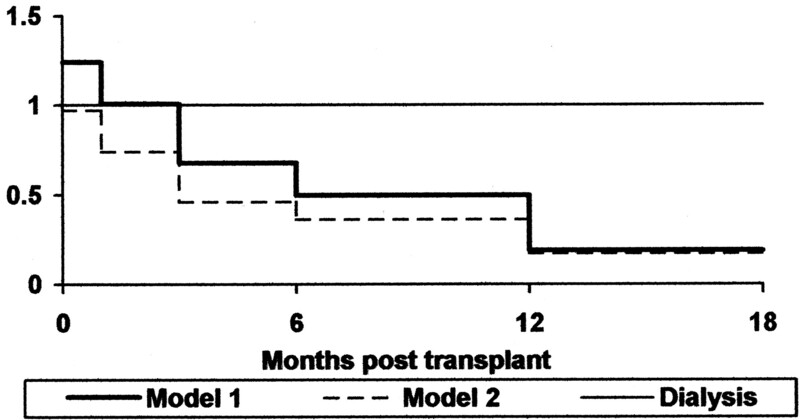 The magnitude of transplantation survival benefit is not equal for all patients, as shown in Table 5. The risks of death for either transplantation or dialysis are not significantly different in the first postoperative year. Beyond 1 yr, all patients have a better survival with a transplant, irrespective of their primary renal disease. However, patients with diabetes have an inferior long-term benefit when compared with glomerulonephritis patients, and this may be because diabetic patients represent a high-risk group of transplant candidates. Age has a significant impact on the long-term survival of a patient, irrespective of the treatment modality. These data indicate that in Scotland, the greatest survival gain associated with transplantation is obtained in patients aged 50 to 59 yr (RR = 0.12; 95% CI, 0.05 to 0.27). But perhaps more important is the fact that patients aged 60 to 64 yr enjoy a benefit of similar magnitude from undergoing transplantation as patients aged 18 to 34 yr, in whom, even at 1 yr, survival on dialysis is not significantly inferior to transplantation. Diabetes is acknowledged as a powerful predictor of death among dialysis patients (17,18); however, as shown here and in most studies quoted before (3,13,15), these patients do benefit from renal transplantation. If one compares the survival benefit in diabetic subjects (RR = 0.33) with that obtained in patients older than 65 y (who are usually considered to be at high risk) (RR = 0.34), it is difficult to advocate why transplantation should not be offered to this latter group. Additional analyses explored the possibility of interactions between all of the variables considered in these analyses, and in particular with regard to the primary renal disease and age. Although this lead to a large number of tests that could have increased the likelihood of a chance result (type 1 error), only marginal interaction between diabetes and age, diabetes and gender, and multisystem disease and age were found. It is very likely that these marginal interactions could become significant in a larger data set. This study presented a national perspective on the outcome of end-stage renal failure patients listed for transplantation in Scotland and therefore allowed a comparison with the study published by Wolfe et al. (3), which presented the US registry data. Despite the differences in size between the two studies, which reflect the population difference, there are a few interesting demographic comparisons. Although there is a higher incidence of end-stage renal disease in the US, a substantially lower proportion of patients are listed for transplantation compared with Scotland (20% versus 38%). Furthermore, only 50% of listed US patients received transplants compared with 63% in Scotland. Diabetes is the main indication for listing and transplantation in the US, accounting for one-third of all patients, whereas in Scotland only 15% of listed patients and 12% of patients who underwent transplantation have diabetic renal failure. The unadjusted mortality rates (per 100 patient-years) on the waiting list and after transplantation are higher in Scotland (9 and 4.13, respectively) compared with the US (6.3 and 3.8, respectively). Nevertheless, the reduction in the RR of death 18 months after transplantation is better in Scotland (RR = 0.18 versus RR = 0.32 in the US study). However, a significant difference is noted with regard to the effects of transplantation in diabetic patients. Whereas in the US they achieve a greater reduction in the RR of death after transplantation (RR = 0.27) compared with patients with glomerulonephritis (RR = 0.39), in Scotland the benefit is significantly lower (RR = 0.33 compared with RR = 0.16). The reduction in the RR of death in this study translated into an overall projected increase in the life expectancy with transplantation of 12 yr, with variation between 3.5 and 14 yr for different subgroups of patients. It is interesting to note that the projected life expectancy on dialysis is better in the US than in Scotland. However, a transplant will lead to a three-times longer life expectancy for the listed end-stage renal failure patient in Scotland, whereas in the US the increase is only two-fold. These results should be interpreted with caution for several reasons. First, they represent extrapolations and therefore the larger estimates may not be accurate. Second, this study covers an 11-yr period, and during this time there have been improvements in survival for all patients, irrespective of their treatment modality. Therefore, for some groups of patients, these particular findings may not be predictive. This study uses an intention-to-treat analysis, whereby patients are considered to be on the waiting list irrespective of subsequent periods of suspension or permanent removal. Furthermore, transplant recipients contributed to the survival on transplantation, irrespective of whether they lost their grafts during the follow-up and returned to dialysis. This has the potential to bias the results in favor of transplantation. There is evidence, from a smaller single-center study (5), in which both an intention-to-treat analysis as well as an analysis censoring patients at removal from the waiting list or loss of transplant function were performed, that transplantation does provide a significant survival benefit compared with dialysis. However, most patients are removed from the waiting list because of deterioration in general health and are likely to die soon after. This has the potential of rendering the death rate on the waiting list almost zero, which would make further comparisons biased as well. In our analysis it was impossible to identify with certainty the reasons why patients were removed from the waiting list and hence an intention-to-treat design was used. However, it was possible to determine when the graft failed; therefore, a second analysis, censored for graft failure, was performed. The results of this analysis are shown in Table 6 and confirm the fact that despite an increased risk of death in the immediate postoperative period, there is a substantial reduction in the long-term risk of death with a functioning transplant compared with continuing dialysis. In summary, this study provides evidence that in the current setting of end-stage renal failure care in the UK, there is a substantial long-term survival advantage for transplantation compared with dialysis. This effect is intrinsic to the treatment itself, rather than an effect of patient selection or higher dialysis mortality. As expected, the survival advantage is not equal across all patients groups, but even patients at high risk enjoy a substantial benefit from transplantation. This should prompt us to reconsider selection and assessment for transplantation, and perhaps a risk assessment score, rather than simple criteria such as old age or certain comorbidity, should be used to admit patients to the waiting list. In addition, these findings provide a powerful clinical tool, which could be used when advising patients regarding the suitability of dialysis or transplantation as treatment for their end-stage renal disease. In a wider perspective, in the current climate of organ shortage, emphasizing the life-saving benefit of renal transplantation to the public may have a positive effect on organ donation rates and thus provide the best treatment for larger numbers of patients.